Bach Standard Series mouthpieces are some of the most popular mouthpieces in the world among both students and professionals. They are categorized from large to small diameters numerically, and from the deepest to the shallowest cup alphabetically. 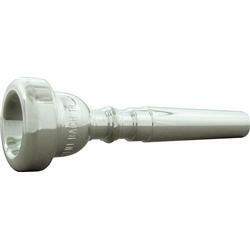 Model 1 Bach Standard Series mouthpieces are the largest cup diameter, and letter A cups are the deepest. Progressively smaller diameter cups are deliniated through number 20 and shallower cup depths are deliniated through letter F.